I have always loved Columbia Harbor House. The setting is cozy and feels welcoming, and I love scoring a spot upstairs by the windows that overlook either Fantasyland or Liberty Square. It is quiet and relatively peaceful but you can do some great people & park watching. As far as the food there is a good variety of choices here, and currently the menu reflects an “Early America” meets “Coastal Seafood” theme. You can find some of my favorite chicken nuggets on property, along with fried shrimp and fish (yes, you could get a combination of these), shrimp mac & cheese, chicken pot pie, a delicious lobster roll that 2 of my friends swear by, and healthy options like salads and grilled salmon. Tying in with the theme you can also get New England Clam Chowder (if the weather is right). Be Our Guest is great for all three meals of the day, but only qualifies as quick service for breakfast and lunch. I’m singling out breakfast because it is hard to find quick service breakfast in the parks—much less a really good one with a great menu. The theme and atmosphere of Be Our Guest is immaculately themed, which is why this place is so sought after for any meal. Even though breakfast is quick service you need to make a reservation for Be Our Guest. The menu includes a croquet madame, a meat and cheese plate (yummmmm! ), a croissant doughnut or a vegetable quiche . . . not your typical “fast food” breakfast, right? Okay, this may not be fair, but the quick service restaurants around the World Showcase are some of the very best on property (with a noted exception later). Each one is themed to its country and offers ethnic dishes that are delicious. My favorite thing to do is to eat around the World Showcase sampling foods from various countries (even when there is not a festival going on). Or letting everyone in our group choose their favorites and meet up in one spot to enjoy together. For me personally the food highlights are found in Kringla Bakeri og Kafe in Norway and Boulangerie Patisserie les Halles in France. My favorite places to sit and eat are Japan’s Katsura Grill outdoor garden seating and Mexico’s La Cantina de San Angel seating by the World Showcase Lagoon. The newest quick service eatery in Animal Kingdom is also one of the best on property. The very unique menu here may not appeal to everyone, but if it does you will discover freshly prepared food with delicious flavor combinations. You can order one of their bowls—with this you choose your base & sauce to go with grilled beef, grilled chicken, panko breaded fish, or fried tofu. There are 4 bases and 3 sauces to choose from. After 5pm you can share a sampler platter with friends that gives you a taste of everything to create multiple combinations. The also offer steamed pods: a cheeseburger version (perhaps for the less adventurous) and a vegetable steamed curry pod. The atmosphere inside the restaurant fits its surroundings in Pandora, unique and other-worldly yet vibrant and beautiful. Hint: stop outside at Pongu Pongu to get a Night Blossom for your beverage. While the atmosphere at this “open air” food court located in Epcot’s Land pavilion leaves a little to be desired, it is my number 1 pick because of the variety of food available—making it an easy location to please everyone in a family. Because the seating is right in the middle of the two story pavilion it is a loud place to dine, and you have a lot of foot traffic with guests making their way to the queue for Soarin’ and Living with the Land. 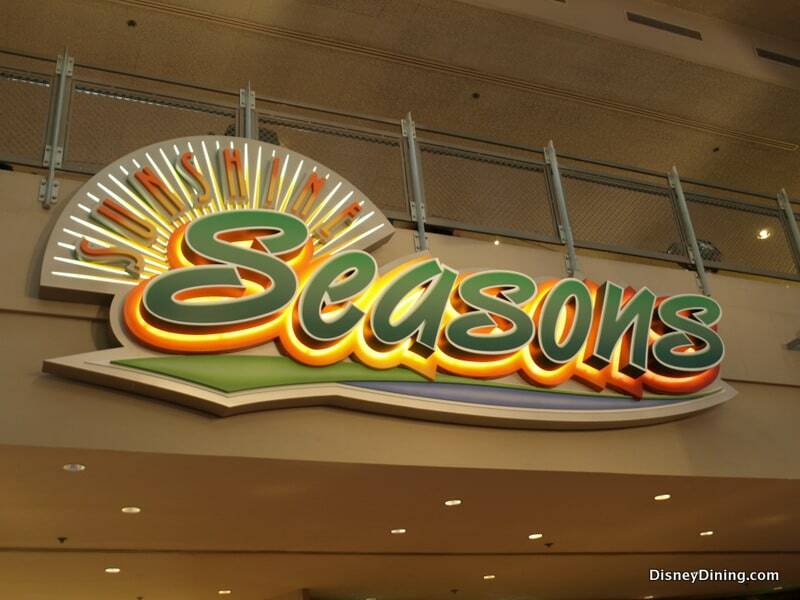 Sunshine Seasons is open from park opening through the day and serves three meals. Breakfast is available until 11am. Here you can find a variety of soups and salads, grab and go items; entrees like salmon, rotisserie chicken, tuna, pork loin and Mongolian beef for lunch and dinner. Something to make everyone happy. I feel like (in general) Hollywood Studios is lacking in good quick service. ABC Commissary falls on the worst list for the blah theming (as if you are on a TV lot getting your meal at the cafeteria). Chicken Strips, Burgers and a Ribs & Chicken combo platter round out the somewhat unimaginative menu options here. I’d love to see them make this into a really fantastic menu to make up for the lackluster surroundings. While Ray’s is fun (although fairly loud) with the velvet tones of Sonny Eclipse entertaining diners, it ranks at the bottom of my places to eat at Magic Kingdom. The menu is par for the course of theme park food where many of the quick service places go above and beyond. It is also a difficult ordering system particularly for families. The best seating, in my opinion is where you have a nice view of the castle. This one makes the list for wasted potential. With so many excellent quick service restaurants around the World Showcase producing fabulous ethnically inspired foods, it is a shame that America cannot do the same in its Quick Service restaurant. The menu could feature a few regional specialties from around the country, or from different groups. The best thing about the Liberty Inn is the ample seating both inside & out. And it is good if you have very picky eaters with you in the World Showcase. Otherwise, treat yourself to some great food at one of the other pavilions. Again, Hollywood Studios falls a bit below the bar for food. And as I said in the beginning, it is not that these restaurants are terrible or should be absolutely avoided, but with the abundance of really good quick service options at Walt Disney World you can choose better (or they could step up their game). I had high hopes for Pizza Rizzo with a fun Muppets theme & pizza offered at the Studios, but unfortunately it just falls into the average category. This may be the one exception about avoiding—because you are at Epcot and can walk right across Future World to Sunshine Seasons for a much better meal, or into World Showcase for good options. Electric Umbrella inside is uninspired, looking like a retro 1980s or 90s setting, but not retro in a fun way. And again, the menu is varied, and it feels like they are trying. The cheeseburger and nuggets are joined by a Vegetable “Naan Wich” and “Energy Salad” on the menu. But really, you can do much better at Epcot for quick service. Which quick service restaurants make your best & worst list at Walt Disney World parks?